The facts speak loudly: according to Nation Inside, more than one in 100 US adults are currently in prison, most of whom are African American or Latino and are serving sentences for largely nonviolent crimes. It’s a broken and cyclical system, targeting members of oppressed communities, locking them up without rehabilitation or help, and feeding them back into the prison system after release. Justice and prison reform are needed now more than ever. Still, facts can’t speak on their own. More and more organizations are using online collections of personal narratives as a way to share individuals’ experiences with the prison system, give voices to the lives prison has affected, and gain traction in the fight for reform. In this post, we examine a range of projects that collect and share personal narratives about prison. We begin with stories told through writing, and move to video stories. Along the way, we emphasize the different advantages that different media types bring to telling the stories of individuals whose lives have been affected by prison. Stories told with writing have some distinct advantages. Writing a narrative can be a more accessible and personal process than working with a video production team. Asking a person to write out their experiences and, ideally, shape that story with the help of other writers or facilitators, can prompt healing and lead to intimate and honest stories. We offer two more advantages of written stories below. → Written stories are accessible. Story collections like Between the Bars make storytelling inclusive to everyone touched by the justice system. Between the Bars is a ‘weblog platform’ created and maintained by the MIT Center for Civic Media. 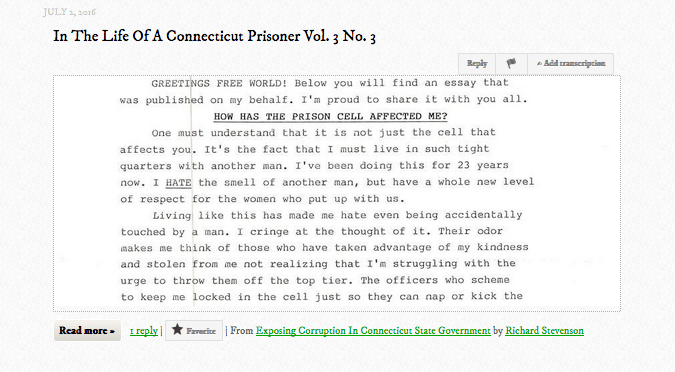 It is a fascinating combination of new and old media: people in prison mail typed or handwritten versions of their stories, which are scanned to the platform, where registered users can then comment on the posts. The organization then periodically mails the authors their comment feeds. While most of the storytellers don’t have access to computers or internet, they can still create dialogue and connect. → Written stories give storytellers agency. Another upside to storytelling without the need for fancy equipment or production teams is the amount of agency this mode of storytelling gives storytellers. Because written stories can be produced and submitted alone—and, if need be, with one’s identity withheld—storytellers have more freedom to share their experiences the way they choose, and in a safer, more honest way. Just Detention is a testament to the empowerment and healing wrought from textual stories. Dedicated to ending sexual abuse in prisons, the organization collects and posts written narratives about abuse and vulnerability behind bars. In many cases, victims explain that they were too ashamed or afraid to tell their stories inside prison; doing so could lead to further marginalization and abuse, their public identities forever tainted. The written medium, however, allows storytellers to conceal their identities and tell the painful story they’re holding onto, and in as much candid detail they see fit. Textual stories put more power in storytellers’ hands, giving them the agency to share and obscure as they desire. It takes one glance at Strong Returns—whose interface bursts with political rhetoric and American flags—to know its eyes are set on change. The organization seeks to spark momentous, nationwide activism, and create real prison reform by 2016. Their political army? Millennials. Their secret weapon? The age-old art of storytelling. University students are encouraged to share their encounters with the prison system and, by creating “viral stories,” sweep the ballots in the next elections. But it’s the type of story Strong Returns collects in its storybank, first-person video narratives, that gives their campaign power. The medium is ideal for telling both layered and straightforward stories for change. 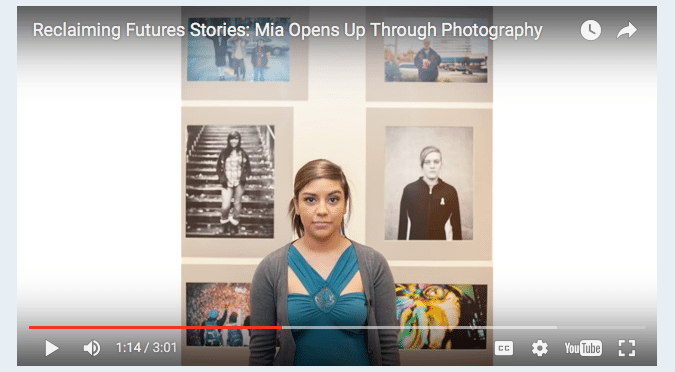 → Video stories can use powerful multimodal storytelling techniques. Video stories have the power to engage the sensory: by layering images, text, and sound, stories engage our eyes and ears in a way that written text cannot. Story collections like those on the Reclaiming Futures website explore these multimodal possibilities with every sound byte and video frame. The organization—which uses art to rehabilitate young people in the juvenile justice system—tells multi-textured stories about their program participants. These stories are not fancy, but they are complex. By creating narratives with music, old photos, and video clips, we become more immersed in the story and organization as viewers. We can see the artwork each participant has created as well as the positive physical changes they’ve undergone as they recover from addiction and physical violence. We can hear testimony about those changes from other people—and, thanks to the carefully chosen background music, engage with their stories in a more intimate and emotional way. The final product speaks to the storyteller’s strength as much as it does the organization itself, and the powerful way it transforms individual lives and touches the community. → Even simple video stories can inspire viewers to respond and interact. All forms of personal stories can inspire their readers, listeners, or viewers to react. But video stories may be unique in their power to do so. The power and immediacy of video is leveraged in a very original way in the Question Bridge project. The overall theme of this project is Black male identity, explored through the posing and answering of questions via video. At present, the conversation filter tool shows that 9% of the participants discussed prison. 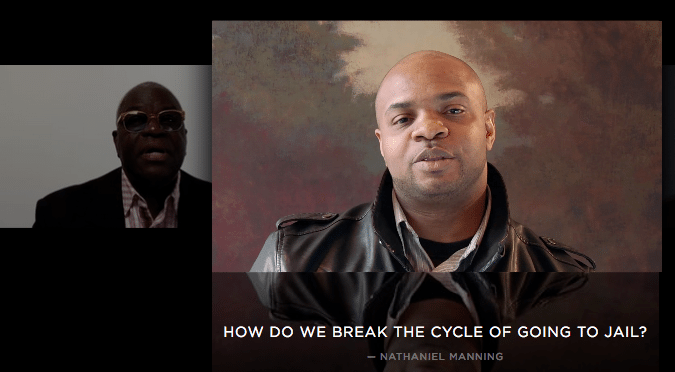 Question Bridge’s goal is to represent the diversity of Black male identity while creating connections within it, and its simple video medium allows users to do just that. Sharing richly different stories through videos, especially while maintaining eye contact with a camera, allows users to build a community that grows and reacts and is subject to change—and the only requirement to participate is an internet connection and camera phone. We also see this opportunity for connection on sites like the storybank of Nation Inside, where many of the posted stories are first-person video testimonials. Scrolling through the feed of stories, we see many perspectives represented: formerly incarcerated individuals, family members of people in prison, and prison-reform advocates. Many of these stories are simple, ‘look-into-the-camera-and-speak’ videos. Despite their simplicity, the stories have an immediacy and ability to engage viewers. There are unique challenges to telling the stories of those affected by incarceration, especially the difficulties of access to those whose stories matter most. But the projects we’ve presented show innovative ways that these stories are being captured, shared, and hopefully, playing a role in building national momentum toward reform.